Other Names: Sogade-beru, winter cherry, Asana, Pevette, Ashgandh, Ashwagandha, Penneroo-gadda, Amikkira-gadday, Achuvagandi, Hirre- gadday, Amkulang-kalang, Asgandh, Hirimaddina-gadday, Amukkira-kilzhangu, Asundha, Fatarfoda, Asvagandhi, Amukran-kizhangu, Asagandha. This herb is a conventional medical component applied in Ayurvedic medicine. It’s originally met in India, Sri Lanka, and Pakistan. The smell of this herb is so characteristic that people even used it when giving a name to this plant. 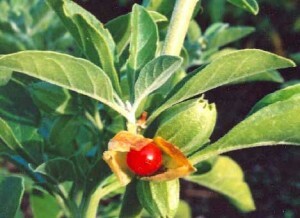 Aswagandha is characterized by green or yellowish flowers on a straight stem. The plant is commonly linked to ginseng, and is very similar to its eastern variants. Commonly the herb is marketed under the label of a sexual booster and life expectancy increaser. Withanolides account for the majority of the herb’s features and treating characteristics. The above mentioned components are highly similar to ginsenosides which can be found in ginseng, growing in Asia. They also produce the same effect on the human body. For this reason ashwagandha is plant commonly referred to as Indian ginseng. The main effect this herb produces is linked with the immunity. Aside from boosting the immune system productivity it is also known as a memory enhancer and an anti-inflammatory substance. For this reason the herb is considered to be one of the most effective energizers. Being potent as a remedy to eliminate depression and distress, it also boosts one’s emotional state. The medicine is commonly applied in form of infusions, oils, liquids, creams or powder. In case of life-threatening diseases (e.g. cancer) 1-2 ounces are consumed on a daily basis. Tea is made of plant roots, which are left boiling in water for a quarter of an hour, and then cooled. The amount of tea consumed is three cups on average (not more than 750 ml). When it comes to luquid forms, they should be applied in a quantity of 3 ml 3 times a day. The plant is not recommended to use in case of congestion. Ashwagandha is known to produce no or minimal negative impact on the organism. Indian children use this plant abundantly. However, there is no information concerning the danger levels of the plant for pregnant or nursing women. You should necessarily have a consultation with your health-care provider if you want to apply the plant for life-threatening conditions, for instance AIDS. Its positive effect in the case of hardly-treated diseases has no proof still.